Towing reviews have become essential as more and more stranded motorists trust reviews to make their tow company choice. We have the technology to engage your customers so you can earn those towing reviews. 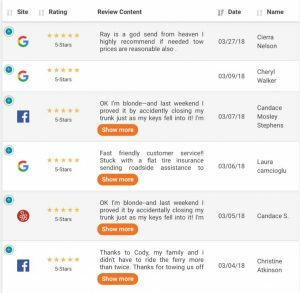 Send customized SMS text messages or emails to start the feedback process post-tow to grow your towing review counts on Google, Facebook, Yelp, YP and your own website. We seek most towing reviews with a text message to a mobile phone number. We can also use an email address. We ask your customers to rate how likely they are to refer your business. Our automated system then directs your happiest customers to leave us a review on a public property like Google My Business. It also directs less satisfied customers to leave their comments privately so you can resolve issues offline. We automatically ask your happy customers who rated your towing company highly to review you on sites like Google, Facebook, Yelp, and Better Business Bureau. Offering a direct link to your business profile pages generates a steady and consistent stream of online customer towing reviews. To automate towing reviews, we can integrate our review tool with dispatch software such as Beacon and TOPS. 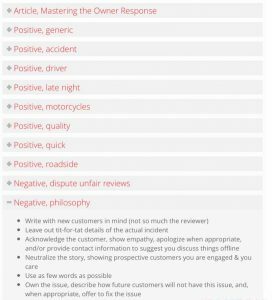 You can also start the towing reviews feedback process by handing customers review request cards, encouraging in-shop kiosk reviews, and driving customers to the website. We automatically display customer testimonials on your website, providing regular installments of fresh, relevant, and valuable content updates. We use Schema markup to promote these star ratings to show on Google search results so you can stand out among your competition. 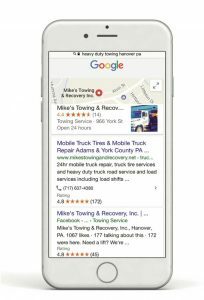 High-volume customer towing reviews create a powerful search result filled with eye-catching evidence to help stranded drivers feel confident in selecting your towing company to rescue them. We send email alerts for feedback and for new online towing reviews so you can celebrate and reward drivers, technicians, and dispatchers who are being recognized. Our team also sends monthly online review reports so you can monitor your towing reviews in aggregate. We provide you a password-protected library of response samples to help you compose succinct responses and to know when and how to request review removal. If you’d prefer us to handle all the responses for you, then you can upgrade to our Sustained Social Media program to get automated responses and more. Proactive online reputation management is a cornerstone business strategy for local service businesses. Nearly 90% of consumers consult online reviews before they purchase local services, so it is critical for towing companies to manage their online reputation or risk being blindsided. 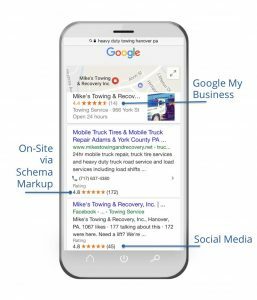 This work yields tow company websites with keyword-rich testimonials and keyword-rich towing reviews across the Internet adding up to better and more visible search results…and ultimately more cash call customers. Add our Reputable Reviews Tool to your marketing mix today.